Jaume Ferrer, Bartomeu Escandell, Rafael González and Daisee Aguilera (the Formentera Council's chair, deputy chair, mobility councillor and environment councillor, respectively) attended the regional parliament's plenary assembly, where the political parties and MPs of the chamber voted unanimously to pass a law for Formentera's environmental and financial sustainability. “Today is a very important day for Formentera. Parlament voted to give the island a tool to decide how many vehicles we want on the island”, explained President Ferrer, who noted the origins of the project could be traced “back to September 2014 with the Consell d'Entitats”. “Make no mistake”, said the CiF chief, “the authority that legislators have handed us today will be used wisely and we will remain ever mindful of that original spirit at the Consell d'Entitats”. Ferrer indicated the rollout effort would began tomorrow. “This is an authority we have been unable to exercise until now. Obviously, there's been work behind the scenes to ensure this didn't catch anybody by surprise, but much remains to be done, and we'll see real discussion about how it will be applied in the coming days”. “Let's take today to show appreciation for this new mechanism and the progress it means for Formentera”, said the CiF chair, adding “we hope regulated vehicle entry doesn't step on anyone's toes. The idea is to create an environment in which everyone who visits Formentera can enjoy it for what people expect it to be: a tranquil setting of stunning natural beauty”. “For five years there's been consensus among islanders that a glut of vehicles could threaten the image we show tourists and on which our livelihood depends. This legislation will make it possible for us to continue as a tranquil island that tourists want to visit and where residents want to live”. The Formentera Council hosted today the Conferència de Presidents, or “Conference of Presidents”, which saw the participation of the presidents, or first ministers, from across the Balearics: Francina Armengol (Balearic Islands), Jaume Ferrer (Formentera), Vicent Torres (Eivissa), Susana Mora (Menorca) and Miquel Ensenyat (Mallorca). Other Govern officials present for the event were deputy first minister and innovation, research and tourism minister Bel Busquets; chief of the first minister's office Pilar Costa, and land, energy and mobility minister Marc Pons. The group met with members of the press after the gathering, where President Ferrer thanked the officials and media reps for their efforts, particularly on a day like Monday. He reminded everyone of the date the conference was originally scheduled —November 26— and how a storm that battered the Mediterranean that day meant it had to be postponed. “Sometimes chance is on your side and sometimes it isn't”, said Ferrer, “once again today wind and rough seas have thrown our port's ability to stay open into doubt, but that is a faithful representation of how things go here”. As to the content of the meeting, Ferrer referred to tomorrow's predicted approval in parliament of legislation that sets out emergency measures for environmental and tourism sustainability on Formentera. He described the legislation as fruit of “a years long effort” and “broad political and social support successfully brokered via the island's league of community leaders”. The local first minister highlighted the approval offered by that entity —the Consell d'Entitats (“Council of Entities”)— for the regional land ministry's draft legislation. “If we manage to secure approval tomorrow we'll be very happy”, said Ferrer, “Formentera residents have long advocated for the ability to regulate vehicle ingress, especially in the high season”. 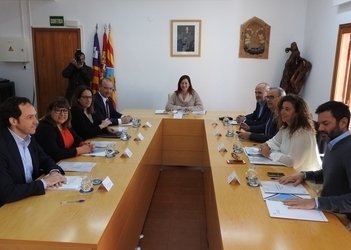 For her part, Govern first minister Armengol welcomed the “spirit of inter-administration collaboration that will lay the groundwork for Parlament's support tomorrow for a pioneering law on Formentera's environmental and financial sustainability”. “We're cutting dangerous emissions and attending the needs of local residents” explained Armengol, “and we've also included €350,000 in direct help for public transport and private transport alternatives”. The presidenta of the Govern also underscored the administrations' efforts this legislative term around “funding upgrades, power hand-offs, improved inter-administration collaboration and this, the seventh 'Conferència de Presidents'”. All of which are clear signs, she said, “that this legislative session is one for the Councils”. At noon today CiF chair Jaume Ferrer and Joan Gual de Torrella, the president of the Balearic port authority (APB), took a trip to la Mola to see the completed remodel of the lighthouse there. 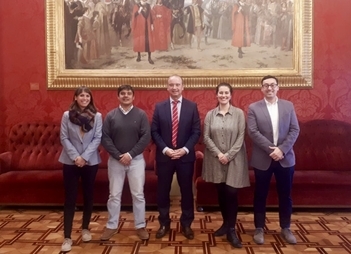 Also on hand were the CiF councillors of culture, tourism and the president's office, Susana Labrador, Bartomeu Escandell and Alejandra Ferrer, along with the project's architect, Marc Marí. Work consisted in a preservation-oriented refit of the lighthouse's ground floor and façade, important elements of cultural heritage. Chairman Ferrer welcomed the visit of the APB president and hailed the atmosphere of warm relations between the two entities that accompanied signature of a deal to give the Council control over management of the lighthouse. The CiF chair said the almost €800,000 remodel by Tragsa is part of an initiative to rebrand the lighthouse into a public cultural space. Ferrer also announced that on Saturday and Sunday every weekend in February, the lighthouse will host open days from 10.00 to 3.00pm so islanders and other interested visitors can come see the new space. The APB president described the initiative as part of the strategy in the Balearics to restore public use to spaces left unoccupied since automation of maritime signals spelled the end of the faroner, or lighthouse keeper. And he saluted the Council on “excellent work that gets where we want to go on enlivening spaces”. Culture department chief Susana Labrador said plans to fit la Mola's lighthouse with museum facilities are ready to go and put completion of the €136,000 project before next season. 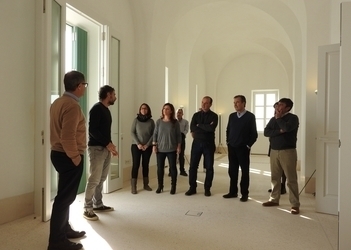 Labrador said the ground floor of the Far de la Mola will have “an interpretative centre encompassing the island's other lighthouses, too, plus a focus on the island's relationship with the sea, fishing and migratory movements, not to mention audio, video and images that explore our island's maritime history”. A multi-purpose space will host cultural programming like exhibits, concerts, conferences, recitals and small-scale theatre productions. The outdoor front patio has been readied for open-air cultural and educational events too, and inside there are a reception area, toilets and a storage space. 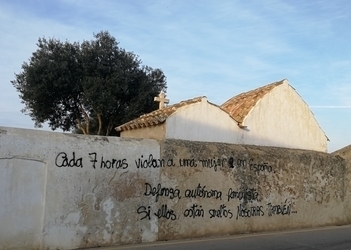 The Formentera Council is beginning work on the wall that encircles the Sant Francesc cemetery, known as el Fossar Vell. Crews brought in by the administration will paint over the political graffiti on the façade and then spread on limestone whitening solution to restore the edifice to its normal appearance. Susana Labrador, the CiF's culture and patrimony councillor, made the announcement earlier today, encouraging islanders to “respect sites like this one that are part of a history and heritage which belongs to all of us”. The cemetery is included in the Eivissa-Formentera bishopric and the Council looks after its maintenance in order to keep it in good condition and share this part of the island's history with residents. In fact, an arrangement between the bishopric and the Council allows the cemetery to remain open for public visits Tuesday to Saturday, 10.00am to 2.00pm. El Fossar Vell, literally “the Old Burial Ground”, has been around since 1757 and was used until 1940. It is listed as a cultural interest site in the island's catalogue of historic monuments.